"Do for one what you wish you could do for everyone." He was acknowledging the paralysis many people experience in the face of what seem to be intractable problems. "What can anyone do to fix this?" people ask. When the answer is too overwhelming to contemplate - or when a solution appears literally impossible - they give in to defeat, often without doing anything. But God calls us to do something. Eloise Drane is a living example of the power of doing for one what you wish you could do for everyone. Several years ago, she donated a kidney to her cousin. He died soon afterward from an uncontrolled infection. Despite the heartbreak of that loss, she was changed by the joy of giving a part of herself so selflessly. Less than a year later, having had four childen of her own (with no fertility issues), she realized there were virtually no resources available for infertile people of color. So, she decided to become an egg donor. Thanks to her willingness to do what many African-Americans weren't even willing to consider, three babies were born to couples who otherwise might never have become parents. Eloise felt called to do more. So, she agreed to be a surrogate for a couple she "met" through the internet. Her husband felt conflicted about her decision. He asked her pointblank: "Do you need to rescue everyone?!" She explained that God had put a burden on her heart for couples who could not conceive, and she felt compelled to do something in response. After a long discussion, he agreed to support her decision. It took three transfers, but she conceived and delivered twins. Last October, she contacted me through the PregnantWithHope.com website. 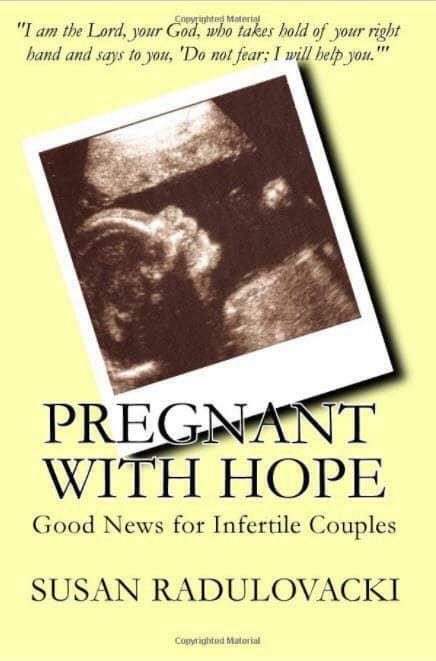 We began talking about her sense that God is calling her to lead a support group for infertile couples using the book Pregnant With Hope as the basis for discussion. This would be a different approach - helping more than one couple at a time. Did I think struggling couples would accept a "fertile" as their leader? Could she support them in meaningful ways if she hadn't experienced infertility herself? We agreed to keep talking and praying about the decision. In the meantime, she agreed to a second surrogacy in the hope of helping another couple. The transfer went smoothly, but there was no pregnancy. She was devastated. "I was so invested in this," she told me, "and so sure it was going to work for them." Her grief surprised her with its intensity — giving her new insight into the rollercoaster emotions infertile couples experience. I believe that was the blessing-in-disguise in this failed attempt. The experience equipped her to empathize more completely, and to talk more comprehensively about the entire infertility journey - its highs and lows. That will make her a better leader when she launches her group next month. Andy Stanley advised, "Go deep, not wide. Go long, not short. Give effort, not just money." Eloise has done that. More than once. Her willingness to break racial taboos and respond to people's suffering with compassionate action has helped bring five babies into the world. This year, may there be others like her who respond to the growing awareness of infertility by saying, "Yes, I want to help someone."